Mixed rice is a boon when it comes to quick lunch plans and also for packing up food for work. 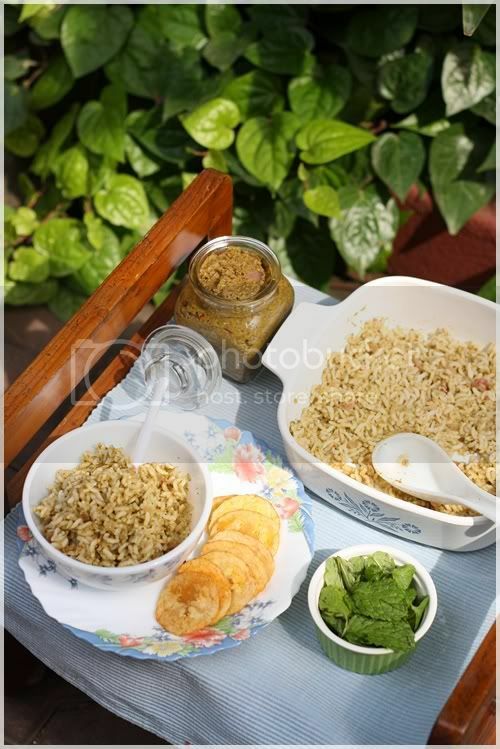 It has for heaven sake been our family favorite too and we enjoy such rices much better than sambar and rasam types of large spreads. A rice with fresh mint flavor can sure be your favorite too. Pluck, clean and wash the mint leaves. 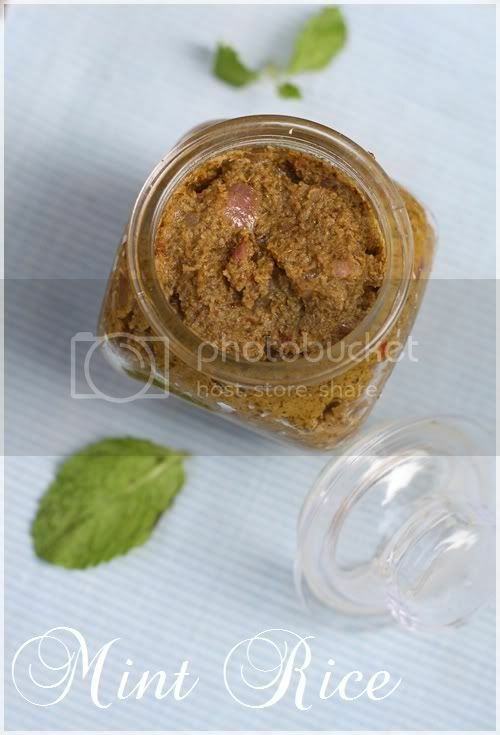 Grind mint leaves, scrapped coconut, red chillies, tamarind paste, jaggery and salt together into a smooth paste by adding some water. Keep it aside. Dice onion into small squares. Take 3 tblsp of oil in a pan and fry the onions until transparent. Now add the ground mint paste and cook on medium flame until it is well cooked and becomes a thick paste. Once done allow it to cool for a while and transfer to a clean bottle. Store in referegerator and use. It will last fresh for two weeks. Cook rice and separate the grains by adding some ghee to it. Now mix the mint rice paste that we made above with the cooked plain rice. See to that you dont smash the rice. Remember to cook rice with a little less water than usual to keep the grains separated. 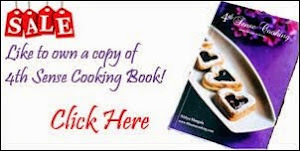 You can use basmathi rice for making this mint rice. 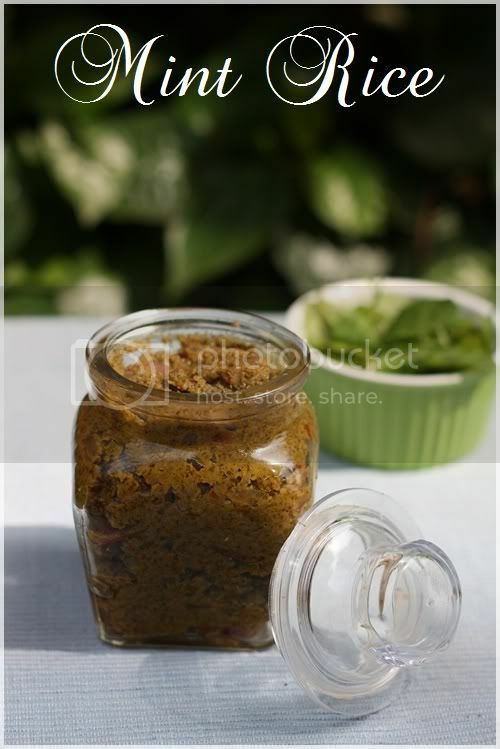 Wonderful recipe Nithya, thats a great paste to have in the fridge at all times! Nice simple version... What was hubby's comment? 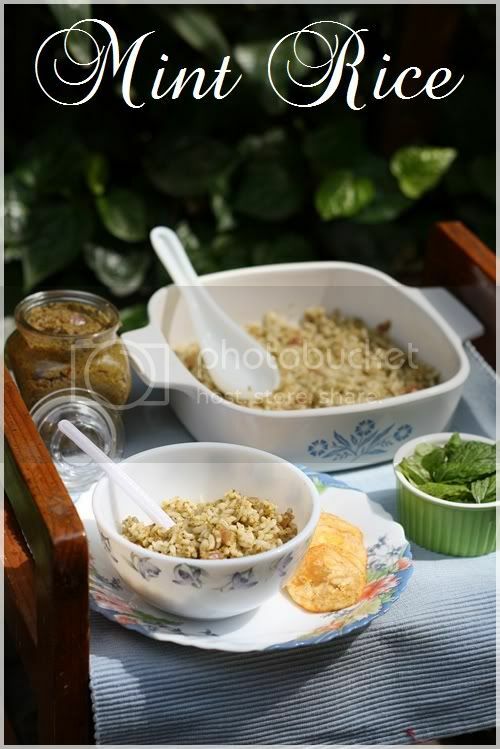 Love how you took the pics outside with the greenary..
Nice recipe Nitya..!! simple and delicious..useful for lunch boxes !! Looks so flavourful and yummy...Luv the new style in the pics...Cool! 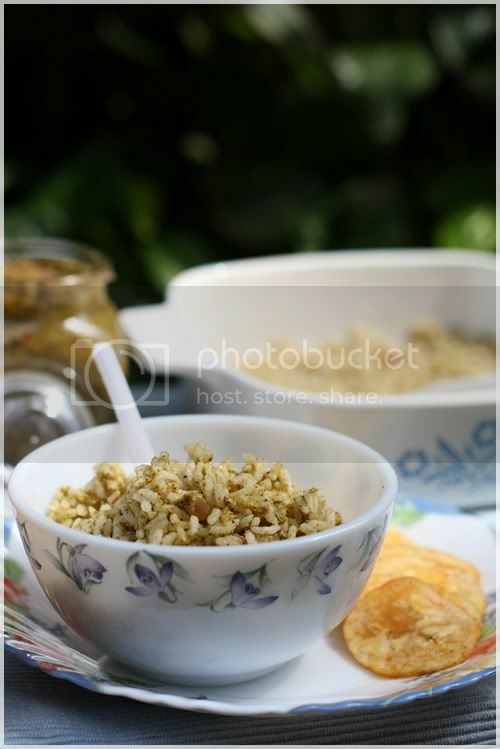 Delicious and stunning pics of Mint rice with the natural background. fantastic nithya!!! too good :) love the idea of making it a ready to use paste! delicious and mouthwatering rice !! Stunning pictures,mouthwatering and flavorful rice..
oh this is nice way to store mint mix in time of need, can imagine the flavors! Yummy and tasty rice.I too prpeare this rice but never know to store the paste.Very nice. Wat a flavourful paste,loving it..
Flavorful & delicious rice...Making a paste & using it where ever you want it is simply superb. It makes life easier..
Hi Nithi! Hope you had a great start ahead of year 2012! :) Loved your set up, wonderful photography! nice readymade paste for one pot meals.. bookmarked :) btw, loved reading all ur posts on ur Italy trip! Btw this pics n presentation were so awesome,loved it !! 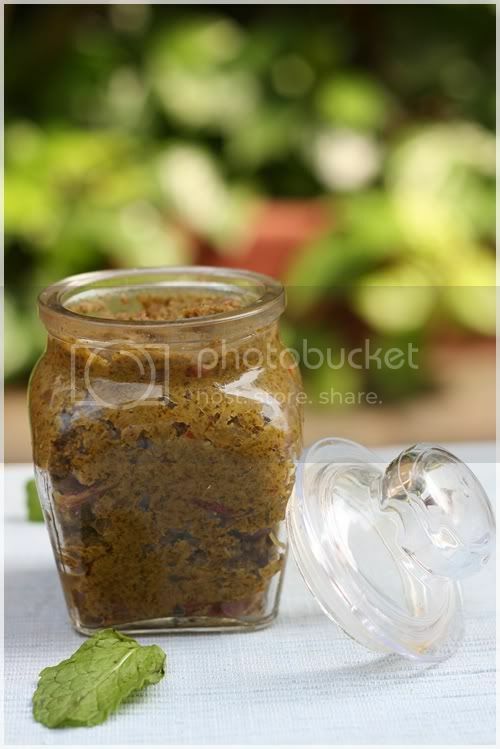 Nithya... We prepare the paste adding coriader leaves ...for 2 bunches of cori leaves, we add a bunch of mint leaves and a few garlic...I found a slight alteration in your recipe...adding jaggery, onion and coconut... I tried it too.. This new version got more appreciations from kids to elders..Thanks a lot Nithya!